Sweet soy sauce (Indonesian: kecap manis) is an Indonesian sweetened aromatic soy sauce, which has a dark colour, a thick syrupy consistency and a unique, pronounced, sweet and somewhat molasses-like flavor due to the generous addition of palm sugar. Kecap manis is widely used with satay. It is similar, though finer in flavor, than Chinese sweet bean sauce (tianmianjiang). It is by far, the most popular type of soy sauce employed in Indonesian cuisine, accounts for an estimated 90 percent of the nation's total soy sauce production. Compared to mildly salty regular soy sauce, the sweet soy sauce has a slightly thicker consistency, and tastes much sweeter. This condiment is made from a fermented paste of boiled black soybeans, roasted grain, salt, water and Aspergillus wentii molds, to which palm sugar is added. The strong sweet taste is contributed by a generous amount of palm sugar — the sauce may contain up to 50 percent gula merah or gula jawa (palm sugar jaggery). Indonesian sweet soy sauce is often enriched with spices, including star anise, cinnamon, black pepper, coriander and clove. Gurame bakar (grilled gourami) served with sweet soy sauce as both marination and dipping sauce. Kecap manis is an essential sauce in the Indonesian pantry. It is used to add a pleasantly mild sweet and umami flavor in most popular Indonesian dishes; including nasi goreng, mie goreng, kwetiau goreng, semur beef stew, and ketoprak. It is also a popular marinade for grilled dishes, such as satay, ayam bakar (grilled chicken) and ikan bakar (grilled fish). Sweet soy sauce is also a popular dipping sauce, mixed with chopped shallot and bird's eye chili and served as dipping sauce to accompany tahu goreng (fried tofu). Steamed rice topped with sunny side fried egg and drizzled with sweet soy sauce is a simple yet popular meal among Indonesian children. Today, sweet soy sauce is used as the ingredient of colo-colo dipping sauce, although traditionally this Maluku sauce uses black colored rendered coconut oil residue. Bango brand, one of the popular kecap manis brands in Indonesia. In Indonesia there are large numbers of sweet soy sauce brands. Kecap manis is traditionally a small-scale home industry. However there are a handful brands that are widely distributed throughout Indonesia and regionally, such as kecap manis ABC, Bango, Indofood and Sedaap. Sweet soy sauce is widely available in Indonesian marketplaces, warungs, minimarkets, supermarkets, toko and Asian grocery stores worldwide. However, it is quite hard to find in most parts of Europe (except for the Netherlands) and also quite scarce in the Americas. Sweet soy sauce can be made from regular soy sauce. Regular soy sauce mixed with brown sugar, added with a trace of molasses, can serve as a substitute for sweet soy sauce. 1 2 William Shurtleff; Akiko Aoyagi (2011). History of Tempeh and Tempeh Products (1815-2011): Extensively Annotated Bibliography and Sourcebook. Soyinfo Center. p. 618. ISBN 9781928914396. Retrieved 15 February 2016. 1 2 William Shurtleff; Akiko Aoyagi (2010). 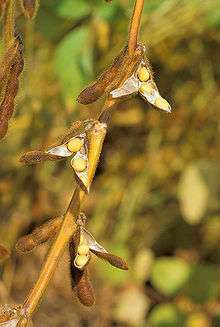 History of Soybeans and Soyfoods in Southeast Asia (13th Century To 2010): Extensively Annotated Bibliography and Sourcebook. Soyinfo Center. p. 537. ISBN 9781928914303. Retrieved 15 February 2016. 1 2 "Sejarah Bango". Kecap Bango (in Indonesian). ↑ "ABC Kecap Manis Rasa Mantap". Heinz ABC (in Indonesian). 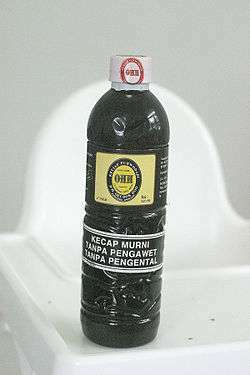 ↑ "Kecap Sedaap". Wings Food (in Indonesian).